Today, the Cassini spacecraft will take an historic image of a Saturn eclipse, with the Earth in the background. Carolyn Porco and Astronomers Without Borders are celebrating by hosting The Day The Earth Smiled. visit http://astronomerswithoutborders.org/projects/the-day-the-earth-smiled.html to find an event near you. July always starts with the Earth at aphelion, it’s farthest point from the Sun in its orbit. This year we reach aphelion on July 5th. Kepler’s second law dictates that Earth is moving a bit slower in orbit right now, so here in the northern hemisphere we actually get a couple extra days of warm weather. Evening planets this month are limited to Saturn and Venus. Look for Saturn high in the SW, Venus low in the west soon after sunset. Venus skims the Beehive cluster on July 3. Venus is easy to see, but you’ll need a pair of binoculars or a spotting ‘scope for the Beehive. On July 10, a very young Moon passes about 8 degrees away from Venus. A few days latter, on July 16, it passes just over 4 degrees below Saturn. If you’re a fan of morning planets, it’s a great time for you. Jupiter and Mars make a dramatic pair, especially around the 22. A very old Moon passes the pair on July 6. Use binoculars to spot them all in the pre-dawn sky. Jupiter passes Mars between July 18 – 23, passing less than 1 degree below it on the 22nd. They are joined by Mercury by the third week. Look for a nice grouping of all three from about July 20 through the end of the month. Mercury reaches greatest westward elongation on July 30 so the last few days of July and first few days of August will be the best days to look for it. Be sure to check out the pre-dawn sies (about 5:30 AM) on August 2, when a crescent Moon, Jupiter, Mars and Mercury all line up in a row in the ENE. The delta aquarid meteor shower peaks at the end of the month. This shower lacks a definite peak, so while the nominal peak is July 29 or 30, you should keep an eye out throughout the last week of July and first two weeks of August. These are long, slow meteors, making this one of the few showers that really does work well for group viewing. Look low in the SSE at 5 AM. 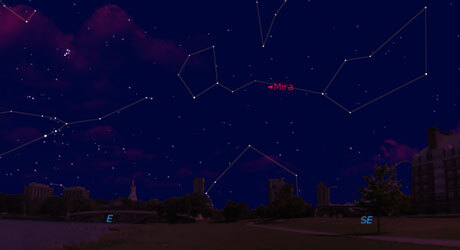 Variable star observers, be sure to check out Mira after July 10. It’ll be at minimum, and there’s no Moon sharing its skies, so you should be able to find it. That won’t happen again until 2017. Location of Mira, in Cepheus, at 5 AM on July 11 (image made using Starry Night). July and August are also the best time of year for looking at all those lovely star clusters near the galactic center. You’ll need a small telescope for these, though they are visible to the naked eye in dark locations. Look for M6 and M7 low in the south around 11 PM. They are open clusters with several bright and colorful stars. M6 is also called the butterfly cluster, though you really do need dark skies to see a butterfly outline. M7 is called Ptolomy’s cluster, and is easily visible naked eye under dark skies. Through a telescope, it is a small collection of bright blue stars against the faiter white and gold of the Milky Way field. 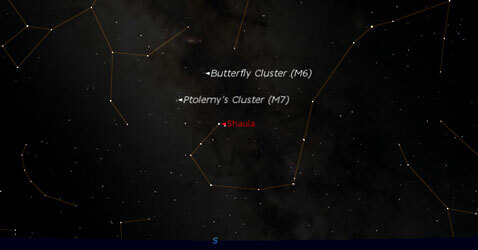 While you’re there, point your ‘scope over to Shaula, the stinger in the scorpion’s tail. It’s a nice double star, though a little low most of the time. Looking at the southern horizon at 11 PM on July 24. Sagittarius is on the left, and Scorpio at the center and right. If you don’t have a good southern horizon, look toward zenith for M13 and nearby M97. These are globular clusters, containing 10s of thousands of stars, but at roughly 24,000 light years away, they appear to be little more than faint balls. They stand out as naked eye objects in dark skies, but in normal urban skies you’ll want a small ‘scope to pull them out from the background light. 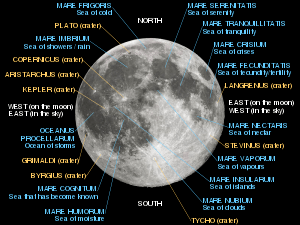 The Moon of course is good no matter what kind of light pollution you have. A little more north and on the day side of the terminator you’ll spot the small young crater Eratosthenes. It sits on the border of the plains of Sinus Aestuum not far from Mare Serenitatis. With a high crater wall and well defined central peak, it stands out nicely in the Lunar twilight. On July 19 be sure to smile and wave at saturn. On that day, Saturn will block the light from the Sun from Cassini’s point of view and Earth will be close enough to fit in the picture too, similar to the portrait taken in 2006. This time however, the team will capture a true color image. According to the JPL press release, Cassini will start obtaining the Earth part of the mosaic at 2:27 p.m. PDT (5:27 p.m. EDT or 21:27 UTC) and end about 15 minutes later, all while Saturn is eclipsing the sun from Cassini’s point of view. Visit http://www.jpl.nasa.gov/news/news.php?release=2013-204 for more information. And don’t forget to check the Cassini website for the image after the 19th.